National Science Week, which inspired last week’s post, finished yesterday, but I decided to extend it a day by writing a post on Australian non-fiction on science subjects. I’ll focus of course on works created for general readers, not academic works. Unlike last week’s list, I haven’t read all the books I list here. Given the surge in general science publishing in the last decade or so, I bet you all have favourites – including of course non-Australian books. I look forward to hearing about them. Tim Flannery’s The Weather Makers: The history and future impact of climate change (2005) is a book I should have read, particularly as I have it in my TBR pile. It won a New South Wales Premier’s Literary Prize for Critical Writing. Flannery is probably Australia’s best known and most prolific scientist-writer. Trained as a palaeontologist, he now uses his science to support his role these days as an environmentalist and climate change activist. For a list of his writing, which includes his quarterly essay on extinction that I have reviewed, check out his Wikipedia page. Mohammed Khadra’s Making the Cut: A Surgeon’s Stories Of Life On The Edge (2009) is the memoir of a urologist. I read it just before I started blogging. Like many science-based books for a general market, this book is not so much about the science of medicine as about ethics and politics. It provides a fascinating insight into the tough life of medical students. I loved Khadra’s discussion of how he arrived at his choice of speciality. Khadra believes that surgeons must understand humankind and that one of best ways to teach this is through poetry! Every chapter in the book starts with a poem, just as his surgical tutorials, when he was Professor of Surgery, ended with poetry. 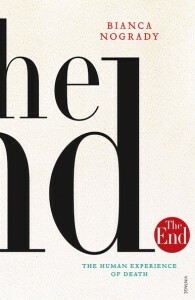 Bianca Nogrady’s The end: The human experience of death (2013) (my review) looks at death from every conceivable angle – medical, sociological, psychological, philosophical, legal and ethical. One of the most intriguing discussions – from a medical and ethical review – in the book concerns defining death. It’s not as easy as it might first appear! Nogrady is an Australian science journalist, and in this book she treads a fine line between expert opinion and anecdote, not letting either run away with the book to the detriment of the other. The anecdotes breathe life into the book, while the experts bring us back to earth! Fred Watson’s Star-craving mad (2013) was described by the Sun Herald reviewer as “a lighthearted romp through the cosmos … [which] tackles the big questions about our place in the universe without ever being pompous, condescending, boring or baffling”. I haven’t read this book, but I included it because I have heard Watson, live, most recently at this weekend’s Griffyn Solo concert focussing on Urmas Sisask’s astronomy-inspired music. Watson is an astronomer who is well recognised as a communicator, winning, in 2006, the Australian Government’s Eureka Prize for Promoting Understanding of Science. Christine Kenneally’s The invisible history of the human race (2014) was shortlisted for this year’s Stella Prize. Kenneally, a science journalist, draws on scientific research into genetics and DNA to explore who we are, where we’ve come from and where we might be going. Little questions like that. I haven’t read it, but some bloggers I respect (Resident Judge and Adventures in Biography) have, and loved it for its lucid presentation of complex ideas. I really should read it. If you’re Australian, did you take part in any Science Week activities, like perhaps the Stargazing World Record event? And, if you’re not (or even if you are), do you have any non-fiction books about scientific matters that you’d like to recommend? My favourite is The Sleepwalkers (1959) by Arthur Koestler, a history of astronomy centred on the life and discoveries of Johannes Kepler (1571-1630). Kepler worked out that the orbits of the planets around the sun were elliptical, from which Newton deduced gravitational force. Thanks Bill … I rather thought there’d be some great books out there about astronomy and astronomers. I like Fred Watson’s writings on science. He makes science easier for me to understand. I loved his book Why is Uranus upside down and other Questions about the Universe. Another great read was 2011 The Best American Science and Nature Writing edited by Mary Roach. I need to have science information in short bursts for me to understand. I also did enjoy Cosmos by Carl Sagan. Thanks Meg. That’s great to hear about Watson. One of the most fascinating science books I’ve read in the last decade was Mary Roach’s Stiff. That collection sounds really worthwhile. I agree with you about receiving my science in bursts, preferably with a spoonful of sugar! Thanks Lisa — I think that fits into the theme. I’ll check your review. I always thought that science and the arts are part of a continuum so I was really pleased to see these books reviewed on your website. Thankyou. But the best science book I ever read is: Lise Meitner: A Life in Physics by Ruth Lewin Sime. Lise Meitner is one of the scientists who realised that the atom can be split and the breakup would liberate a huge amount of energy. The basis of nuclear power and nuclear bombs. Parts of this book (about 100 pages of the 540) can be hard going for a non-scientist, but the rest, the story of science, scientific research, the personalities of the top scientists who worked in Germany and Europe before and during WWII, is absolutely fascinating. Nice list! My university library has The Weather Makers. I think I will have to borrow it once I finish a book or two on my in progress pile! Really? You’re reading enough at the moment 😀, Stefanie? You could go for a reading PB and add it in!